Glucose Dehydrogenase enables the regeneration of NAD(P)H from NAD(P)+ by catalyzing the oxidation of D-glucose to D-glucono-1,5-lactone. Glucose Dehydrogenase enables the regeneration of NAD(P)H from NAD(P)+ by catalyzing the oxidation of D-glucose to D-glucono-1,5-lactone. 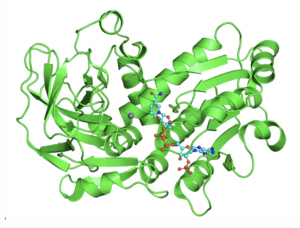 Member of the family of short-chain dehydrogenases/reductases. Typically used for cofactor regeneration of NAD(P)H consuming biocatalytic reactions and driving the reaction quantitatively towards product formation by irreversible (chemical) hydrolysis of D-glucono-1,5-lactone to gluconic acid.